mere anarchy: W00T! 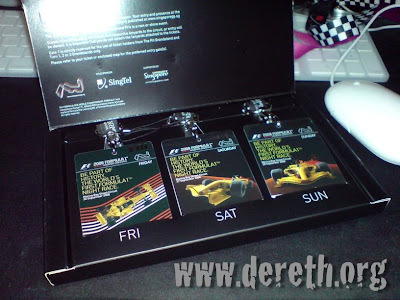 A Pair of Singapore F1 Grand Prix Grandstand Tickets! W00T! 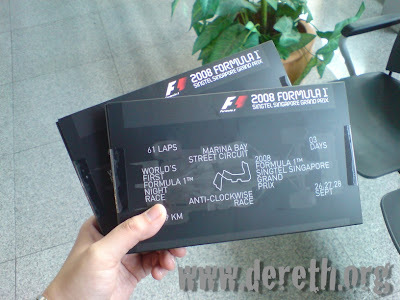 A Pair of Singapore F1 Grand Prix Grandstand Tickets! Attended "SingTel i.Luminate Business Innovation Forum 2008" today. Whole day event from 8am to 6pm. 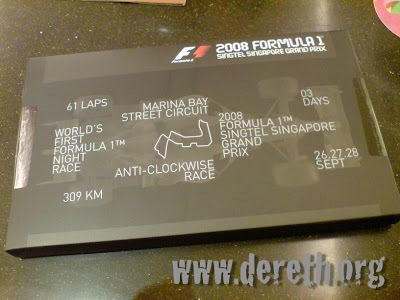 To qualify for F1 tix you have to stay until at least 5pm. Damn lucky I lingered around... it was kinda noisy and I didn't realise I had a missed call. "CONGRATULATIONS! YOU'VE WON FOR YOURSELF A PAIR OF F1 TICKETS!" "Should I sell them off or should I go watch?" Sorry, no time to blog! The rain in Spain falls mainly in the plains? Most dreary drops of dew. Sony Ericsson Xperia X1 "Live" Unit Spotted! Copyright © 2007 mere anarchy.